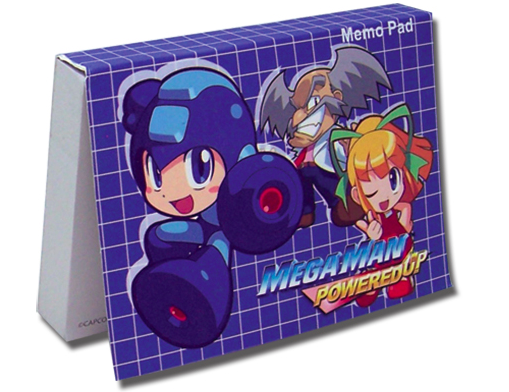 Rockman Corner: Another Round of Merchandise: Office Supplies! Another Round of Merchandise: Office Supplies! Our monthly preview of upcoming licensed Mega Man goods from GE Animation is here. The latest haul is ideal for the office space: there's a memo pad, a coffee tumbler, an elastic-band document folder, and a handy dandy notebook. Yes, this stuff can make even the dreariest desk look homey! Click the links above for more images. Be on the lookout for these trinkets at your local pop culture retailer. I'm really tired of them using the same artwork on all of this merchandise. I have to agree. While I do personally like Powered Up's artwork, I do get tired of seeing the same thing over and over. The plush doll was really all that was worth it, imo. Couldn't agree more with you guys! I, too, am tired of seeing the same artwork over and over. :( It's cute and all, but come on! I want variety! WHAT AM I WRITING FORRRRRRRRRRR? !